Sometime F1 entrant Willi Kauhsen storming up the hill in the thundering ex-Jo Siffert Porsche 917/10-001, a non-turbo 650bhp Can-Am beast. 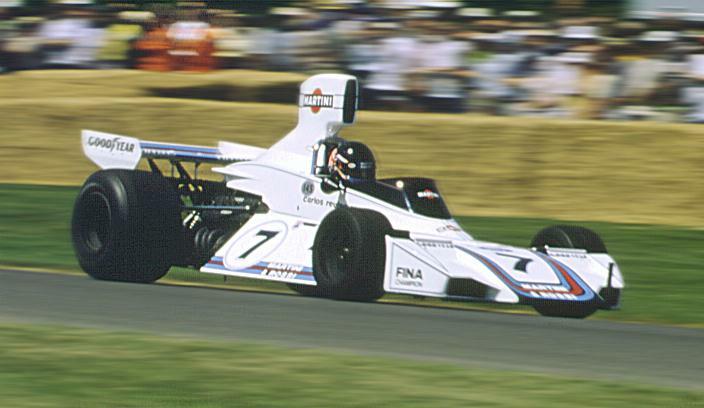 In 1972 Kauhsen took over the car after Seppi's death to finish second in the '72 Interserie championship. 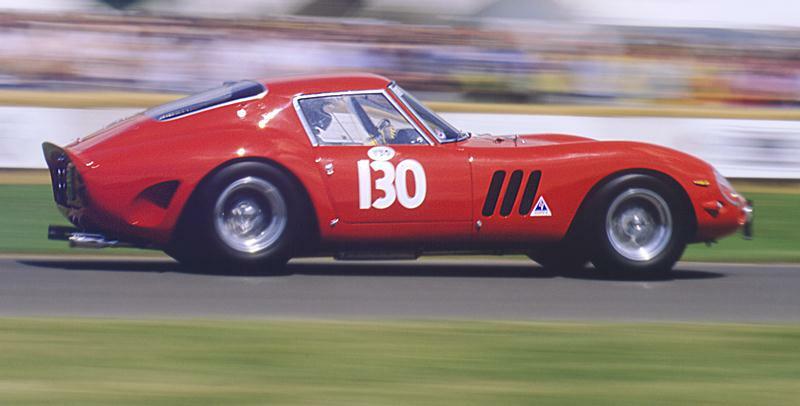 A lavish West Sussex estate, a ten-foot wide country road, thousands of speed and noise addicts, and dozens of the most awesome motor racing machines of the past century: that's the Goodwood Festival of Speed for you. The 1999 event proved to be the best ever, as 8W editor Mattijs Diepraam and photographer Frank van de Velde report. Judged by the weather alone this year's festival was already a vast improvement over previous editions. Apart from a freak outburst of rain early Sunday morning the sun was out all three of the event's days, warming both tarmac and skins, and putting a wonderful glow on the cars and the stars. If you dared to go around without sunglasses the sight of the green-and-orange Mazda 787B Le Mans winner gushing out huge exhaust flames was enough to take them out all the same. Of course, in terms of sheer speed, power and acceleration, Heidfeld's majestic runs up the hill were the highlights of the event. Unsurprisingly, his Saturday 'practice' run of 44 seconds flat received the largest spontaneous applause of the day. He revealed that on this occasion he had stretched his limits on a couple of turns and - this is perhaps where the official West McLaren Mercedes spin doctor interrupted Nick's carefree banter - maybe it would be wiser to leave it at that for tomorrow. Fortunately he neglected team orders on Sunday afternoon. It could have been to assure Ron Dennis he wasn't endangering the priceless museum piece that afterwards he claimed he was keeping well within the car's limits, but it didn't look like that for one moment… "That was quite quick", he said, and we knew it. In fact, the MP4-13 was the only recent F1 car to be driven up the hill in anger, the high-pitched V10 sound reaching you a full five seconds earlier before the actual car came in sight. John Watson said it right: "The F1 cars of the seventies were seriously fast cars but compared to them these modern Grand Prix machines are rocketships." The bulk of the visitors however didn't come to watch a rocketship blast up a one-mile stretch six times in three days. We had wonderful cars visiting the event, with a heritage reaching back to last century, or, if you were into '99-spec Le Mans racers, last week. Plus we had a host of stars past and present at autograph distance. Every visitor had his own agenda. There were quite a few who didn't go anywhere but the Brooklands paddock, which was set up exclusively for pre-war (both of them) cars. A large number of endurance die-hards had also flocked to Goodwood, as this year's Le Mans celebration would be bigger than ever. And then we had the main paddock stuffed with seventies and eighties loose F1 canons. Our photographer got all gooey from the large collection of Auto Union and Mercedes Silver Arrows and then went wild with excitement some more over the two Renault F1 turbos, bringing back lots of youthful nostalgia, while your reporter couldn't keep his eyes (and ears) shut near the sixties Honda F1 machines and stood in awe from the sight of John Watson's Brabham-Alfa BT45. Although worlds apart, these experiences had one thing in common: they all contrived to a feast for the automotive senses: looks, feel, sound and smell - they were all there. It was also the first time the smell of burnt motor oil reached our noses, a sure sign the event was now well underway. This was Enthusiast's Day, Part One of the Festival and perhaps the most enjoyable because of its casual atmosphere. For the competitors this meant that when a co-competitor's truck broke down near Worthing, you would go out with a trailer to collect the rare Edwardian stranded on the A27. For the visitors it meant crawling underneath your favourite veteran, chatting with the engineers or stretching your credit card limit for a rucksack full of fresh motoring books. Meanwhile, at the Le Mans paddock in front of Goodwood House most of the winning cars were on display now, almost completing a full circle of over 25 victorious prototypes and GTs. Still missing were this year's BMW and ORECA Chrysler winners but Audi had been early in bringing in both its battle-scarred open-top R8R and closed R8C from the latest Le Mans edition. As Audi's latest models still go without victory all attention was deservedly diverted to the glorious exhibitions of Auto Unions which even came with a period transporter truck. Audi's main attraction had to be the V16 hybrid 'Bergwagen', Auto Union's mean machine for the European Mountain Championship, once the biggest show next to Grand Prix racing. The double rear wheels, testimony for a total lack of rubber technology, looked both monstrous and magnificent, as they were the only means of converting the V16's awesome power into traction. Racing the silver car was Hans-Joachim Stuck, the only rightful heir to the elder Hans Stuck's legacy. "Herr Stuck, it's a lovely day to go out for a drive", Stuck Jr was asked. "That's certainly true but with this car I'd prefer rain", he quipped. Indeed, his mount was one of the few oldtimers to go for a splash on Sunday morning. A few moments earlier a BMW Motorsport transporter arrived - and there it was, the Dalmas/Martini/Winkelhock V12 LMR, still covered in dirt and oil, fresh from its famous victory at the Sarthe. There were hums of approval, someone even made a halfhearted attempt to applaud the car, but on Enthusiast's Day you just don't go wild. As it was, Munich apparently said the word verboten to any serious runs all weekend, enabling the GT2 winner to upstage the overall victor, Justin Bell hammering the remarkably effective Viper GTS-R up the hill within striking distance of the top three. The main paddock was already bustling with activity at lunchtime. One of four covered stands was entirely filled by Ferrari machinery and people were swarming all over the sixties GTO and Testa Rossa models, adjacent to the P4 and 333SP sportscar racers connecting two decades of Ferrari two-seater glory. 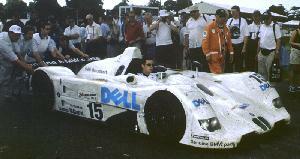 Mercedes-Benz had also managed to have their cars camp out together, with the noteable exception of the 1994 Penske PC23 and its 1100bhp one-race Mercedes V8 pushrod engine. But as the Penske wasn't primarily silver, looks won over corporate identity for once. As a consolation the Penske team received a double parking space, the only outfit to be granted such extravangance. Also, the PC23 by far had the best sound of all Mercedes-engined cars on the track. Even in low gears it outclassed the Sauber-Mercedes and a modernity such as the CLK-GTR in the noise department. Maybe the W154 or the two W196s would have topped the excitement provided by Emerson Fittipaldi but neither of the classic designs were driven in anger by Coulthard, Alboreto, Moss or Fangio II. The latter two did manage to pull off a stylish performance on Sunday by slowly driving uphill, waving to the crowd, their W196s in battle order, as if they were emulating the lap of honour at the 1955 British GP. The first Friday practice runs ran late as several competitors learned the track. The older cars especially were eased in gently, a lot of them hampered by misfires, while the seventies Grand Prix cars lacked grip on their substitute Avon tyres. Most of the vintage Le Mans cars also took it easy, turning first practice into a demonstration run (although some of them managed to get off of the track at the hands of some unexperienced drivers). There was one exception. 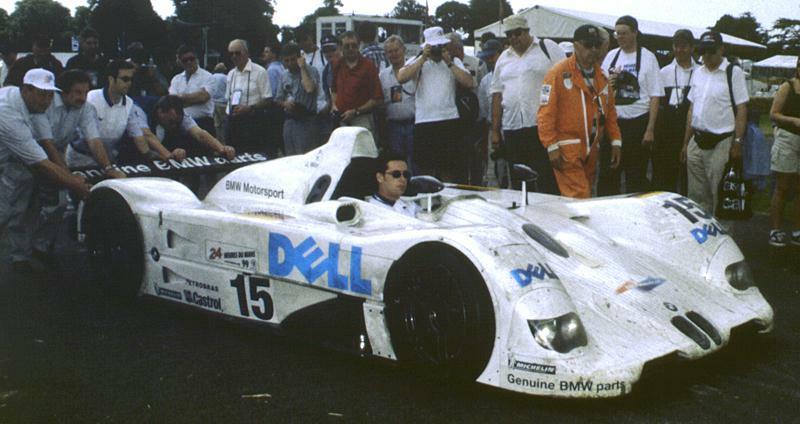 When former F3000 driver Peter Hardman took the wheel of the legendary Aston Martin DBR1 he showed what a real racing driver - instead of a careful owner - could still do with 40-year-old machinery. Showing masterly car control, Peter did everything to get the thing sideways on purpose whereas his class rivals were so respectful to their priceless possession that they set out to prevent their cars doing so. Hardman's Aston extravaganza proved quick as well. On Friday he set fifth fastest time and stayed close to the top ten on the days following. In the meantime, the WRC showcase of Messrs McRae and Burns was also off to a good start. 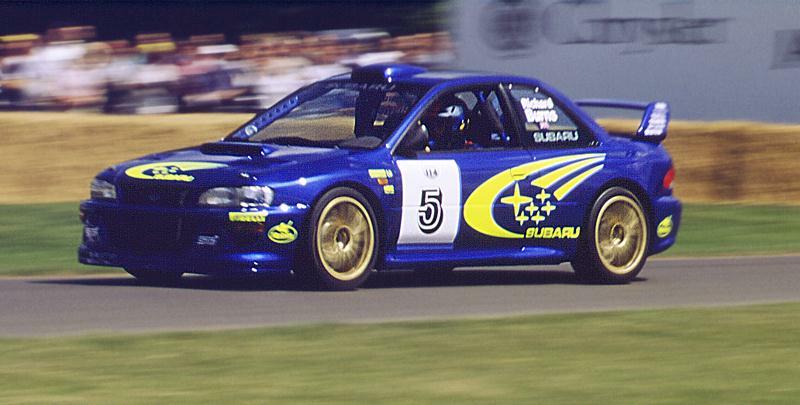 It was apparent for all to see that the Subaru star was on a high after his recent Acropolis win. Immediately, his first run was quicker than McRae's and that set the trend for this private battle between two accomplished British rally stars. Burns enjoyed himself ostensibly, upsetting the Goodwood gardeners on Sunday by cutting off Crossroads and Molecomb on the grass, trying to gain as much advantage from his 4WD traction as was humanly possible. Eventually, he finished the weekend with a 51.08s, ten seconds down on Heidfeld and trailing the likes of Mass and Surer in ten-year-old turbo cars. Again that was proof that WRC cars and tarmac do not make a match made in heaven. After being outrun on tarmac by Philippe Bugalski's F2 Citroën Xsara in the Catalunya and Corsica rallies the Ford and the Subaru had to concede to rear-wheel power once more. Even Charlie Agg's huge 8-litre CanAm March-Chevy from 1970 (almost as wide as the entire track) matched Burnsy's best, the 'Boeing' 707 underlining the fact the hill is best to be regarded as a one-mile drag strip. Compared to Burns, McRae looked fairly uninterested. He never drove his Focus on edge and even relinquished his final Sunday run for an early drive home. The Ford man has had a hard time since his surprise Monte win and it seemed his recent lack of luck has got to him in a Damon Hill kind of way. Still, the Scot provided for Saturday's quote of the day. When probed by Bob Costanduros on his lack of speed compared to his Impreza-mounted rival, Colin made his sincerest apologies. "I had a big breakfast." On Saturday morning many of us had quite a few laughs. This we had Lord March to thank for, since he not just sent out invitations to the owners of the world's best looking racing cars but had the nerve to mix them with some of the most outrageous machines in motor racing history. This event's number one folly just had to be the 'streamlined' Le Mans Cadillac, aptly nicknamed 'Le Monstre'. This ghastly rebodied vehicle, developed in conjunction with the Grumman aircraft factory, turned out to be so unwieldy that they were outpaced by the normally bodied Caddy sedans. So much for windtunnel tests! Would motorsport journalist Doug Nye have understood the joke as he drove it uphill? Other frightful contraptions to prove some designers had a sense of humour (or two eyes for purposeness and none for looks) were the Nardi Twin-Boom monstrosity and the Rover-BRM turbine car (exactly why Graham Hill and Jackie Stewart agreed to race this thing at Le Mans remains a mystery, with the added surprise that they actually finished the race in 10th place). Another one was the Pikes Peak Audi, driven by Austrian rally star Harald Demuth. This winged monster was a serious piece of equipment, however. With 720bhp on tap it proved one big muscle stretching and flexing to get uphill. 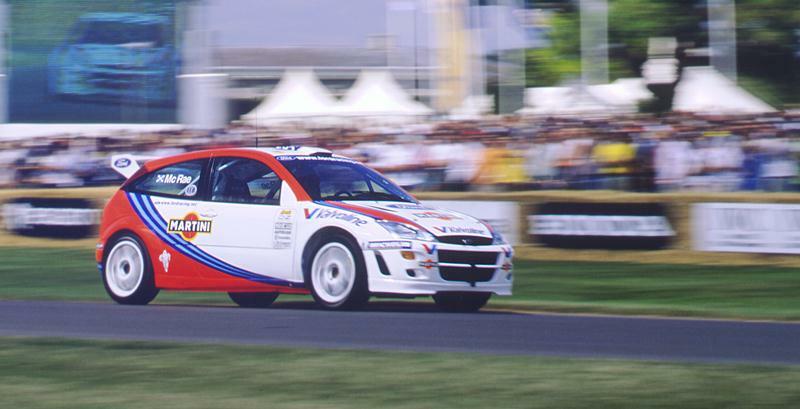 It wasn't far off the pukka WRC cars either. Which was not to be said about Michèle Mouton's original quattro S1 Evo, the misfiring car robbing us from the French girl's usual driving zest. Talking of Audis, Frank Biela's IMSA GTO 90 quattro was another Ingolstadt invention amounting to science fiction. Its humming engine and whistling gear changes created a unique soundscape among the usual noise-a-rama. And then we had Jonathan Palmer's costly spinner, right in front of our very noses. On Friday, JP had been prowling the Honda Collection stand in the main paddock, reacquainting himself with the Japanese engineers. The former McLaren test driver and Goodwood record holder looked keen to get into his mount and strolled around the three sixties models Honda had brought along as well. In the end, these were to provide the main Honda excitement, the high-winged 1968 RA301 especially battering everyone's ears with its monster 3-litre V12 noise. 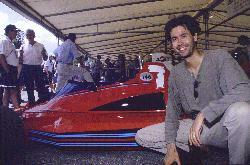 Together with the Hondola driven by John Surtees himself it easily belonged to the group of loudest cars on show. 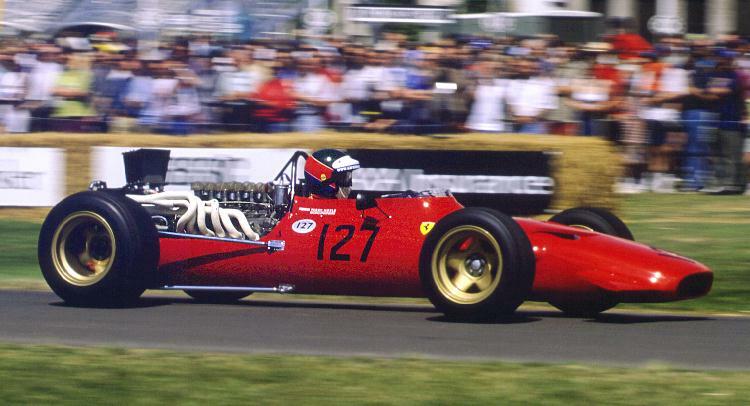 It was a shame the original RA272 suffered a misfire throughout the event, for this revolutionary design with its transverse engine mounting played an important in sixties F1 history. In contrast, the modern Honda-engined cars made lacklustre appearances. On Saturday morning, with lunchtime approaching, Palmer was out to please the crowd on his way to the start. Out of the paddock assembly area, underneath the bridge, the Doctor gave it some stick, to the delight of the onlookers. The atmospheric Honda sound was masterful but Palmer's car control wasn't. As he turned into Crossroads the back wheels were still spinning, violently throwing the MP4/5 around. It was JP's bad luck that he was driving the track in opposite direction: exactly on the fatal spot the straw bales were stacked all towards the trackside, its original intention being to prevent stray cars from flying into the Le Mans paddock. Now it acted as a saboteur to JP's record defense. Skidding off, the McLaren almost immediately hit the outer bale with its right rear wheel, damaging the suspension. The red flag was out, and so was Jonathan Palmer. Still in the car, he grabbed his helmet in despair. He won't have believed what just happened to him. His mistake was cheered from the stands, but the Honda people weren't laughing. To the delight of Hans Stuck Jr - and probably only him - the umbrellas were out on Sunday morning. Most people were still hanging around in the Cartier Style et Luxe area where a Concours d'élégance was fought out between a huge fleet of Horch cars, a rare Monica, the first Maserati Quattroporte, a four-wheeled Messerschmidt and a pretty little Lancia coupé - amongst others. On the track the few veterans and Edwardians daring to go out for a spin (no pun intended, of course) looked quite a handful in the wet. Then, suddenly, the dark clouds turned white and soon a bright blue sky appeared through the ever-growing gaps. This bode well for the final runs in the afternoon, when it soon came clear that everybody meant business. Well, almost everybody. Just as previously done by Stirling Moss and Juan Manuel Fangio II (whose regular ride of the weekend was his uncle's 1940 Panamericana Chevy), Derek Bell and Jacky Ickx made the Gulf Mirage's last waltz up the hill a slow one, the famous duo taking the meaning of a 'shared drive' quite literally as the Belgian sat on the top of his former team mate's legs while Derek tried his best not look uncomfortable… The leg cramp must have lasted for a while, though, as on his serious run in the Rothmans Porsche he got into a tank slapper on the last slope before the finish, brushing the tail of the mighty 962C against the straw bales. Following was Bell Jr in the Viper who at the top asked around what lunatic had been putting straw all over the track. Nice one on Father's Day, Justin. Of course, there was disappointment as well. The two F1 Renaults both encountered numerous problems during the weekend and had limited outings, both Arnoux and Tambay complaining of malfunctioning turbos, the same applying to its Ferrari counterparts driven by Tambay and Alboreto. The Le Mans-winning Rondeau was a no-show, while Jean-Pierre Jaussaud's other drive of the weekend, the Alpine-Renault A442, produced a harsh sound during all its appearances. 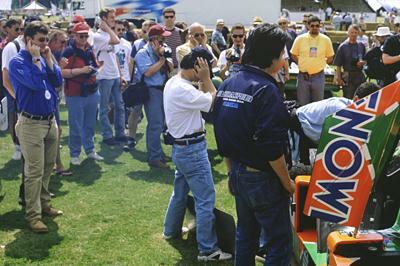 Must have been a while since that engine was fired up… Many of the old-day Indycar stars were seriously rusty as well, just as their machinery will have been. The single exception was Johnny Rutherford in his Gatorade McLaren-Offy but then he is keeping fit as a pace car driver these days. And then there were those, well, instructed to take it easy: Marcel Tiemann in the Merc CLK-GTR was one, Walter Röhrl in the Joest Porsche WSC Spyder another. Fortunately, Jochen Mass and Allan McNish had no ears for Mercedes or Porsche corporate wishes and hammered their C11 and 911 GT1-98 to times around the 50s mark, Mass doing a 49.0 (which turned to be the second time of the day), McNish a 50.7, earning him fourth. Surer was third with 50.6. For many that concluded the weekend's proceedings as we all returned to the car parks. It had been a beautiful three days. We had been bathing in sunshine and engine noise, spoiling our senses infinitely, but when the end inevitably arrived, we were left satisfied to the full. Indeed, the best-ever Festival of Speed, as Autosport magazine rightfully headlined in its report. Still, for the 8W team at Goodwood, the fun wasn't over as we sneaked onto the adjacent Motor Circuit. There we found the gate to the start-and-finish straight left open by the track manager! This had also come to the attention of some bloke in a very second-hand but nonetheless extremely fast Porsche 911 Turbo, sporting a Pikes Peak-size rear wing with which he no doubt was aiming to impress his shy girl-friend in the passenger seat. Having asked politely if he could have a go, the Porsche geezer was surprised to find out that was OK, "but you will have to follow my track because I'd hate to clear up the mess", the good humoured track manager said as he walked back towards his Audi A4 Turbo. Err, sir, could we get on as well? Oh sure, no problem, he waved. Trying to follow the turbo cars we were of course left trailing halfway around the lap but nonetheless we discovered that Honda has made a very stable, driveable car with its latest Civic… When the gate immediately closed again behind us, we realized we had received special treatment. The huge smiles on our faces lasted all the way back to the Channel Tunnel.